Every Saturday, between 8am and 4pm, The Esplanade Markets showcase local, quality made products from jewellery, leather work and homewares to pottery, clothes and skincare. If you need a gift or souvenir you are sure to find it here. 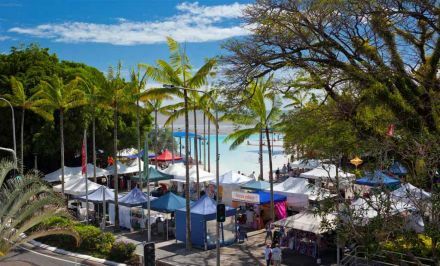 Held against the scenic backdrop of the Cairns waterfront, you can follow your market shopping with a swim in the Lagoon or take advantage of the free barbecues, exercise equipment and children's playgrounds. To be part of the market please complete and submit the application form. Please allow 10 working days for applications to be processed. For information regarding other Council markets, please visit the main Council website. Saturdays, between 8am – 4pm, the market showcases items crafted by the people who sell them.